On Sunday, Donald Trump announced that former executive chairman of Breitbart News and Trump campaign chairman Steve Bannon will serve as chief strategist in the incoming administration, working as “equal partners” with chief-of-staff-to-be Reince Priebus. Neo-Nazis around the country are thrilled. White supremacists of all stripes—whether they call themselves white separatists, white nationalists, the alt-right, or just straight-up Nazis—have supported Donald Trump’s candidacy from its inception. 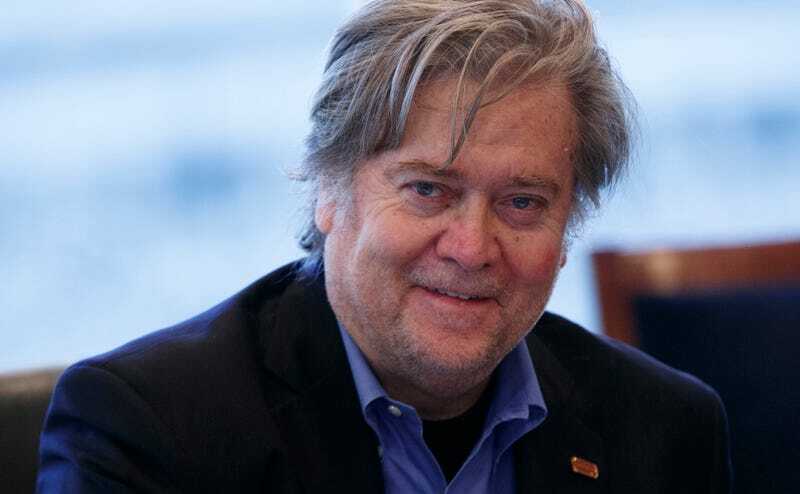 Bannon’s move from the movement’s flagship site to the campaign itself over the summer was seen as an enormous victory. That Bannon should only gain more power as Trump enters the White House has the racists and bigots who put him there giddy with the possibility that he really did mean all those things he said during the campaign. Ken Reed, the national director of the neo-Nazi group Aryan Renaissance Society, posted a news story about the Bannon appointment to a Facebook group with the comment, “Can you say WINNING boys and girls?? ?” and followed with the hashtags #WhiteLivesMatter and #AltRight.